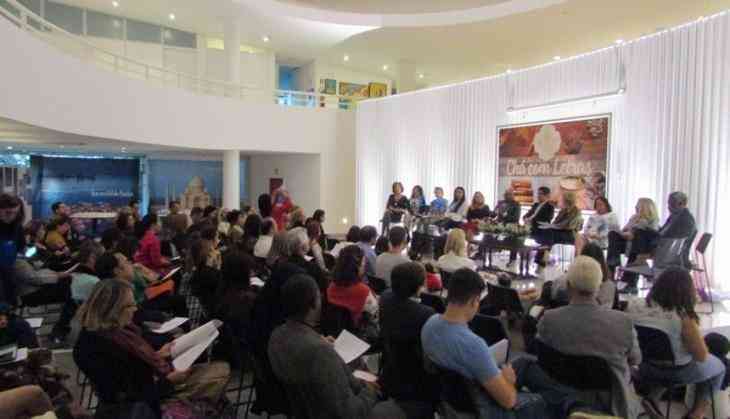 The Embassy of India in Brasilia, Brazil, recently organized the 18th edition of Cha com Letras. The event also celebrated the contributions of timeless Brazilian poet Cecília Meireles through a reading of her poems written during her trip to India in 1953. Meireles is among the finest poets of Latin America and is counted in the company of such greats as Octovio Paz and Pablo Neruda. She was deeply inspired by Indian culture and wrote about prominent people such as Mahatma Gandhi and Rabindranath Tagore and places such as Delhi, Patna, Puri, Banglore, Hyderabad in her poems. In her Elegy on the death of Mahatma Gandhi she wrote- "The afternoon wind comes and goes between India and Brazil tirelessly." Writers and poets who participated in the event included Margarida Patriota, writer and teacher at UnB; Malu Verdi, author of many books; Gustavo Dourado, writer and President of Taguatinga Academy of Letters; Noelia Ribeiro, writer; Maria Coeli, film-maker; Gracia Cantanhede, writer and lawyer; Maria de Ariston, writer and teacher; Meire Fernandes, President of International Culture Academy, teacher and writer; Ana Barros, teacher and writer; Clotilde Chaparro, writer and lawyer; Maria Felix Fontele, journalist and writer. On this occasion musician Joel Oliveira sang popular Brazilian songs. Children also participated in the event and read Meireles's poems like "Leilao de Jardim", "A Bailarina" and "O Vestido de Laura" meant for the younger audience. Cha Com Letras is a monthly literary event organized by the Embassy of India, Brasilia at its Chancery Premises moderated by Abhay Kumar, the Deputy Chief of Mission. It started in January 2016. So far, 18th editions of Cha Com Letras have been organized which have been attended by over a 1000 people from the literary community and diplomatic corps in Brasilia.